Gnarlee's World-Adventures of the Gatlinburg Spokejunkie. 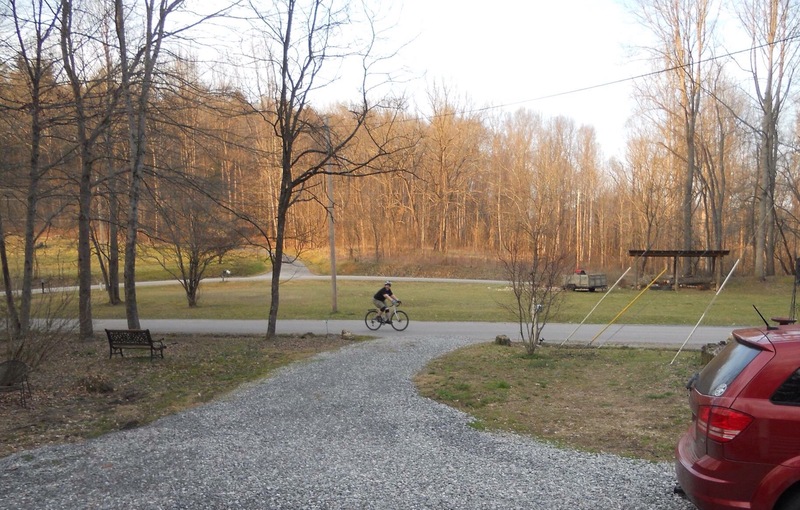 | Bike building, aerospace and other adventures from the Gatlinburg Spokejunkie. Gnarlee's World-Adventures of the Gatlinburg Spokejunkie. So, last that I had posted the AWOL was ordered. It arrived the following week. This bike has been one of the most perfectly fitting bikes that I’ve ever owned! 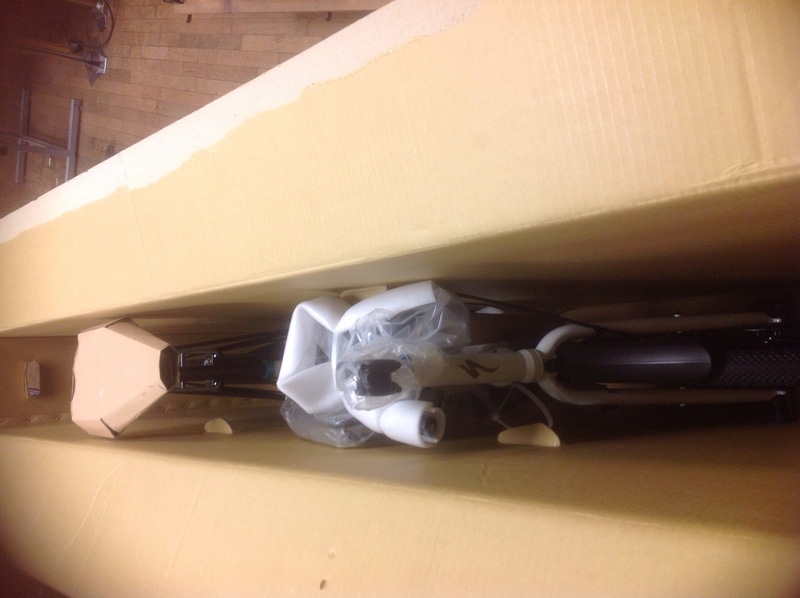 It arrived in a huge box, due to the fact the wheels and fenders were already attached. And then around the same time my uncle called and asked me if I wanted his old bike. Unfortunately, he can’t ride anymore. 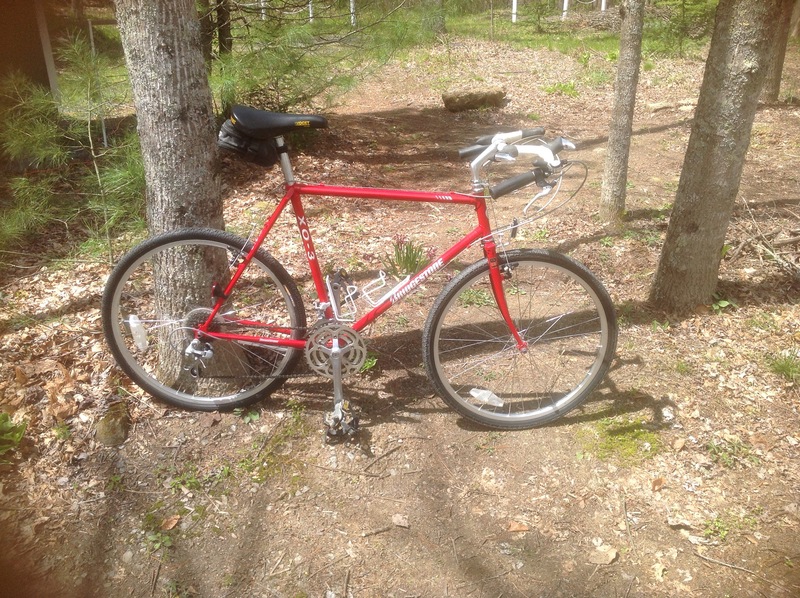 Well, I have been wanting a Bridgestone XO since…1992 and the first one I saw raced at the local mountain bike race. My uncle had a ’93 XO-3. After having my cousin in Indiana pick it up and then drop it off to the local shop my friend Kathy works at, my other uncle picked it back up to bring it with them on their visit down here to NC. It was dirty and dusty but in great shape. I finally got it back into riding shape last night. Had to put some tires on it to get it rolling and lots of polishing. It rides great. The moustache style bars are strange but actually quite comfortable. I had to roll them a little for my comfort on the grip area. And the dummy brake levers on the front strangely feel very road bike like. I haven’t used the dummy levers toward the inside yet. Strangely, the Avocet saddle wasn’t bad. 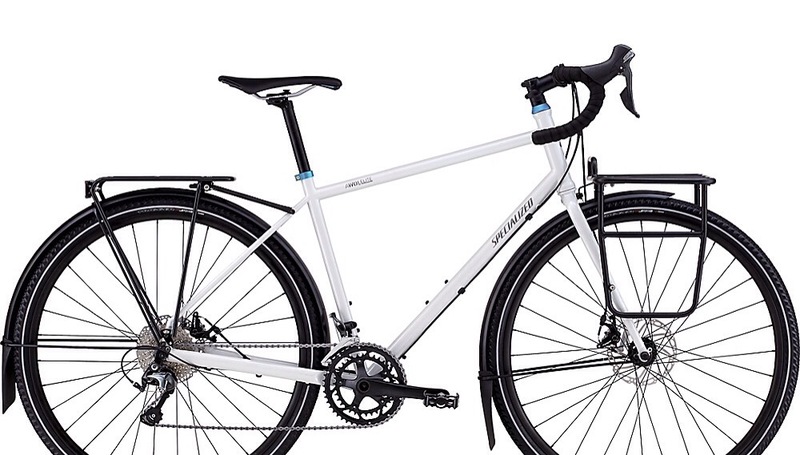 But I think this may be the bike that I finally try a Brooks saddle on. 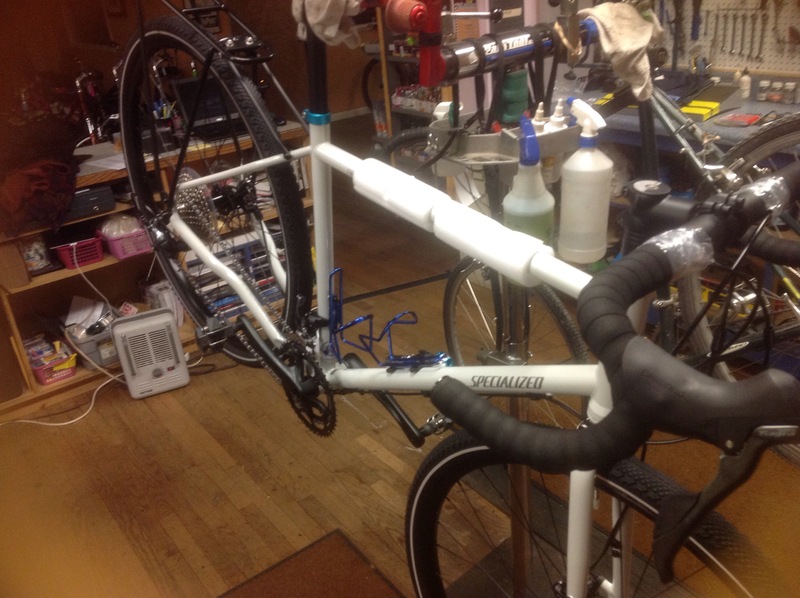 Yesterday I ordered a new bike. I tend to love it when an old steel frame comes through the bicycle shop door. I became enamoured with them during the Bridgestone years. I think I had a RB-? and at the local mountain bike races we did in Lafayette, Indiana I fell in love with the XO series. I have wanted one since. Fast forward to a couple of weeks ago. My uncle called and wanted to know if I would like to have his old XO. Not sure which one or the year, 92 or 93, but I said yes. Yes, please! In the next few weeks I should have it arriving at my door. Around the time of the call with the XO an old Peugeot mountain bike graced our doors. And I had the priveldge of getting it back up to speed. 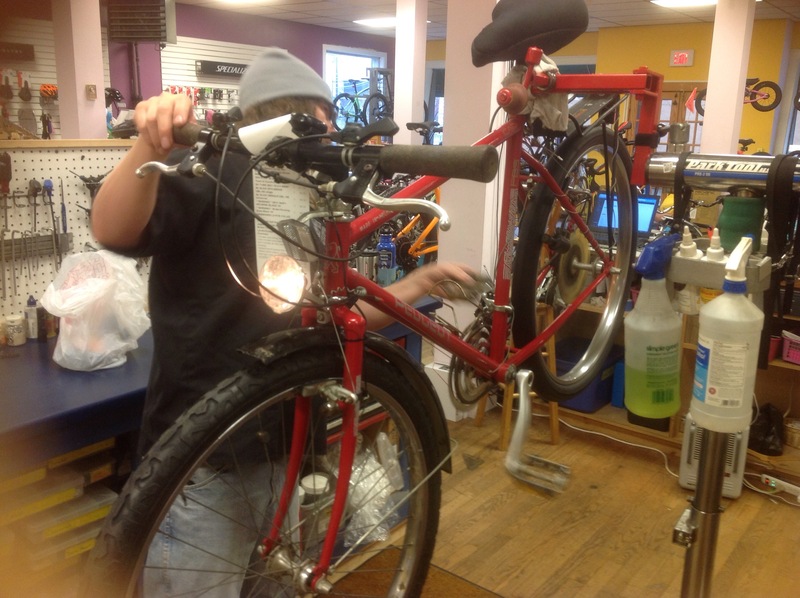 I overhauled it, put new tires on, and my co-worker found an old generator that worked to hook up to the lights still on the bike. It turned out quite well. I took the pictures with the wheel spinning so the lights would show up. 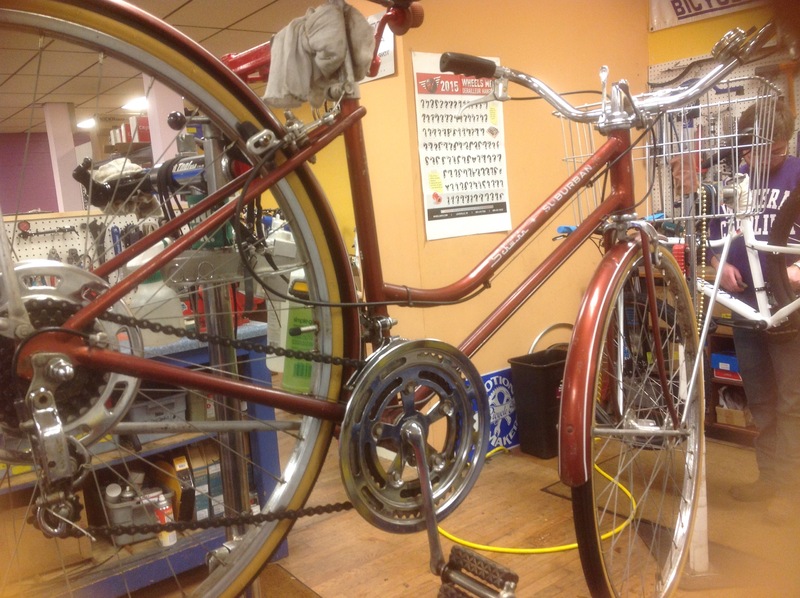 This bike was purchased in Europe by a serviceman who rode it all over while there. He wanted to get it back up and running to ride around. There was some nostalgia going on. Just this past week we had another similar situation. 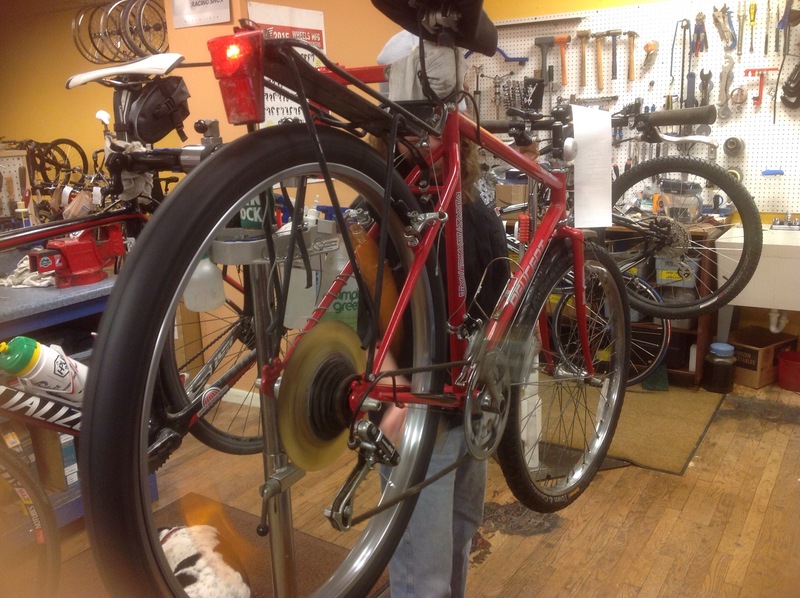 A European Bridgestone Wild West was brought in for some fine tuning. I believe the man was also stationed over there at the time. We chatted a bit about Bridgestone’s. I think he was surprosed anyone even knew what it was. Which brings me to a future post. We have a road bike museum developing in part of out store. You should start to see those posts mixed in with the rest. Hope that it’s nice, sunny weather to ride where you’re at! 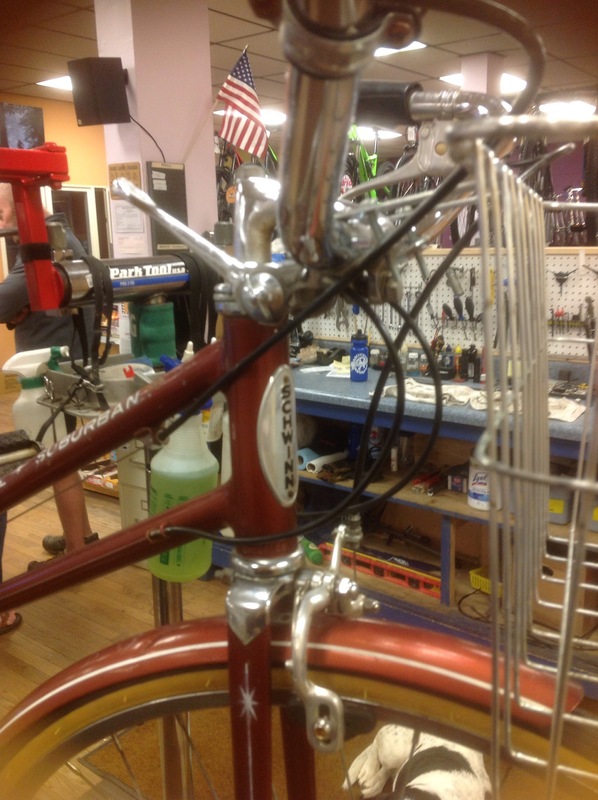 This Schwinn came in yesterday for new tires. They were so dry rotted that the nubs left on them could cut you. We got to talking about the color, chestnut, which a couple of us had had in the Varsity variety. The Suburban still looks good, a few nicks and chips here and there. Besides the tires, a little lube, some polish, the only other problem was a stripped rear axle. I dug up one from a donor wheel that it’s rim had seen better days. She’s good to go now! Well, the shop I had visited in my last post is now the shop that I work at. And I couldn’t be happier! I will post more as I go. 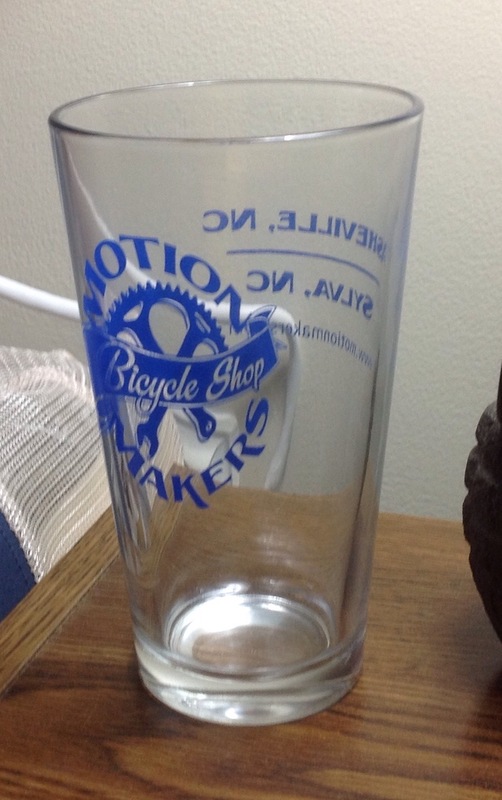 I decided that I would make the short drive down to Sylva, NC today to visit Motion Makers Bicycles. The owner, Kent, used to be the Specialized rep early on at the shop I most recently worked at. Picked up another pint glass to add to my collection and got a bunch of recommendations fro pubs, coffee shops, and places to eat. Then I headed up to Waynesville. I got off the highway and took Old Balsam Road which goes by an apple orchard I wanted to check out. I didn’t stop this time, waiting for relatives to visit and go out there with them. 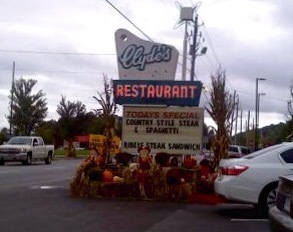 But I did stop at Clyde’s for lunch and had the best 1/2 pound burger that I have had in a long time! Once I finally got home I took some time to finish digging the drainage ditch around back and clear the one on the front corner of the property. Seeing as there is a possibility of more rain from the storm Joaquin. We’re ready to go now. Took Albert out to Lake Junaluska a little while ago. We walked along the lake and came back to where we parked…there happens to be a coffee/ice cream shop there. So an ice cream cone for me and a bottle of water for Albert on their back deck facing the lake sitting on rocking chairs. I should sleep well tonight! Long Absence and a New State. Well, we have hopped across the mountains from East Tennessee to Western North Carolina. Finally have the house around and mostly in order. At Least for this year. Made a trip back to Tennessee to get the storage locker cleaned out last week. This included most of my bikes. 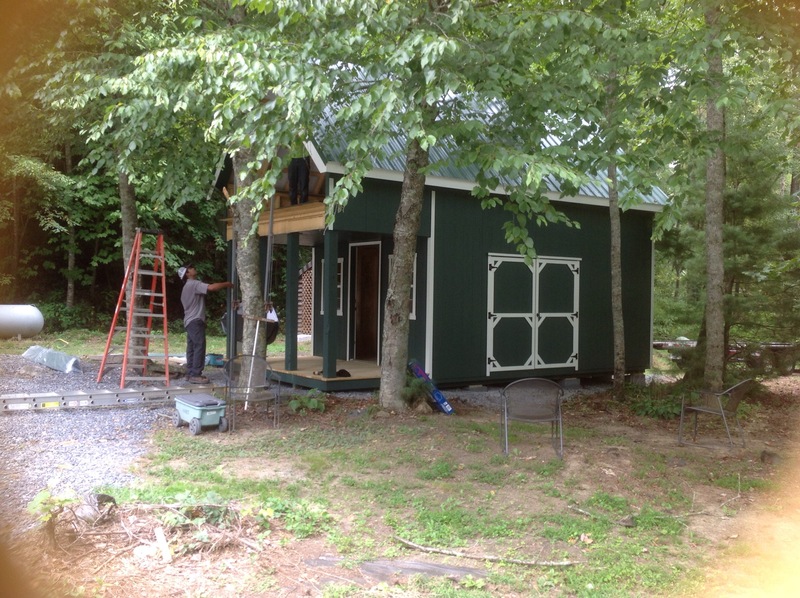 So, now the rebuilding begins in the new storage shed. I have the second story and that’s where I’m putting the bikes back together. 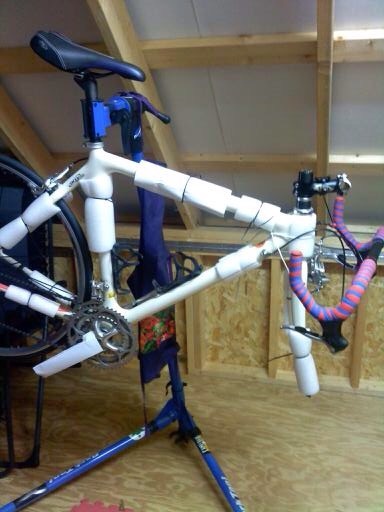 Click BICYCLE INFO in Category Look Up below for random info I have found surfing the internet in search of how-to's for fixing problems. Work in progress!